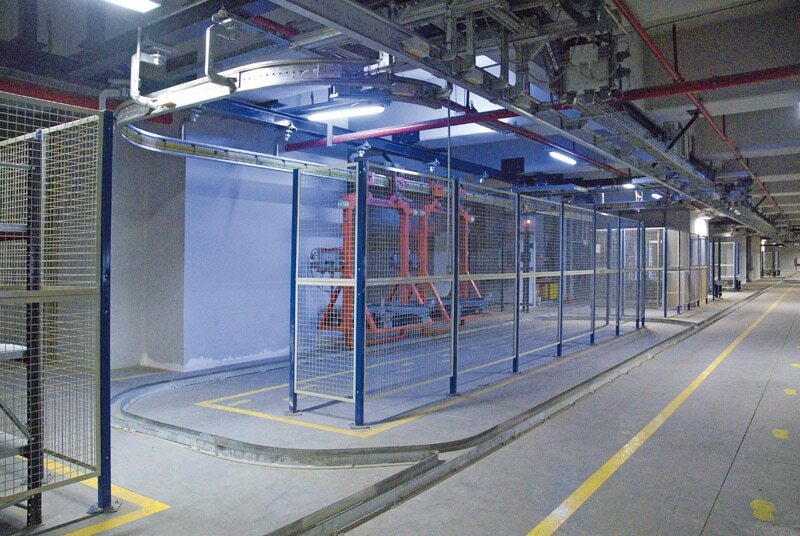 Electrified monorails are one of the fastest goods transport systems that can be set up in a warehouse. Their main advantages include the high efficacy, speed and continuous movement flows, as they are able to move pallets steadily 24-hours a day. There are two commercially-sold models, with different applications and performance levels: aerial electrified monorails and inverted, floor-mounted ones. 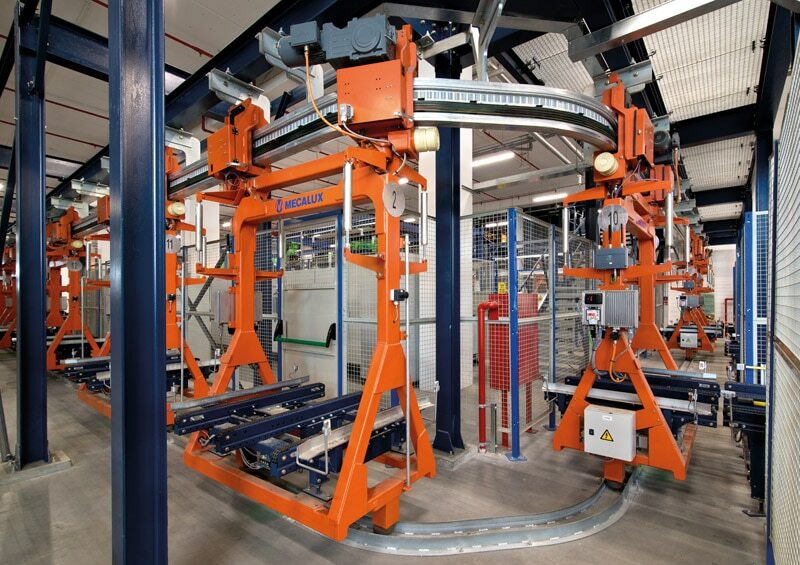 This discontinuous transport system is composed of automated trolleys driven by an electric motor. These slide along an I-shaped electrified rail that can be either hung from the ceiling in the case of aerial electric monorails, or fixed to the paved surface of the warehouse in the inverted models. Its job is to transfer pallets between the different stations located along its route. Electrified monorails substitute –or combine– with roller or chain conveyors when medium or long circuits need to be set up, or when quick transport is necessary between different loading and unloading stations. Apart from that, the loading and unloading stations are comprised of the different versions of conveyors, which are linking elements. The maximum number of pallets in motion is limited by how many trolleys are in operation. However, accumulation points can be added with conveyors in specific zones of the circuit. Trolleys –that include chains or rollers– can move products of various sizes, weights and formats (either pallets or containers). This transport system is suited to Euro pallets (800 x 1,200 mm), pallets of 1,000/1,200 x 1,200 mm and half pallets (600 x 800 mm). Autonomous, intelligent transport: trolleys work individually, shifting the goods between a point of origin and a destination. The synchronisation between adjacent trolleys is ongoing, each one of these communicates with the trolley in front and behind it through a control programme. High-velocity transport: the trolleys move at a maximum speed of 120 m/min when unloaded or 100 m/min when transporting a 1,000 kg load. This system is much faster than chain and roller conveyors (whose speed generally do not exceed 20 m/min). In addition, the time needed to collect or deposit pallets in the different stations is minimal. This advantage makes electrified monorails especially useful for connecting long distances. A configurable circuit: the distribution adjusts to the space or the characteristics of the building and consists of straight stretches, curves, crossings or parallel lines. An infinite number of personalised circuits can be designed, capable of linking different warehouse areas, distinct warehouses, the same warehouse with production or even buildings separated by a tunnel (in this case, the electrified monorails circulating inside it) and, also, can include parking or maintenance areas. The result is a versatile, suitable transport system in centres that plan to modify its design or expand in the future. A modifiable system: the circuit can be redesigned at any time and can accommodate new loading or unloading stations if this is required. Thus, the number of trolleys moving within a circuit varies and matches the number of pallets that must be transferred, and can be increased as per the company’s growth. Circuits can have a parking zone, where trolleys remain on-hold until they are used. Easy, reliable maintenance: there is a maintenance area outside the circuit. Trolleys are sent there when they require some sort of repair or assistance. Despite being taken out of the circuit, the system keeps running as usual. Much easier to clean: this is especially true for the aerial electric monorail models, since the floor is obstacle-free and this facilitates cleaning work. Cost efficient system: the trolleys are only used as need (either when goods must be transferred to a certain point, or when they are empty and must be returned “home”, or sent to the next station, etc.). Since not all the trolleys are moving within the circuit at one time, this optimises power usage and, likewise, prevents components from wearing out, which cuts down on maintenance work. 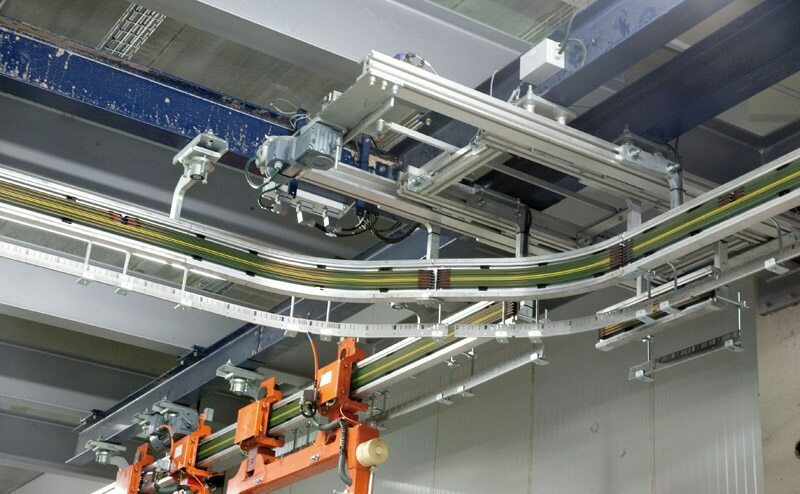 It is fundamental that a powerful control software is implemented for the electrified monorails to work correctly, all connected to the warehouse management software (WMS). The trolleys are enabled with control units connected to the central warehouse computer wirelessly. The latter is tasked with sending commands to the trolleys and telling them which route they must go along to reach their destination point. This route is determined according to rules and parameters that streamline the movements of the electrified monorails and delineate the shortest path. It is possible to install changes in direction, diverters and shortcuts along the circuit used to created secondary paths to stop the trolleys from having to run through the whole circuit to reach the different stations. 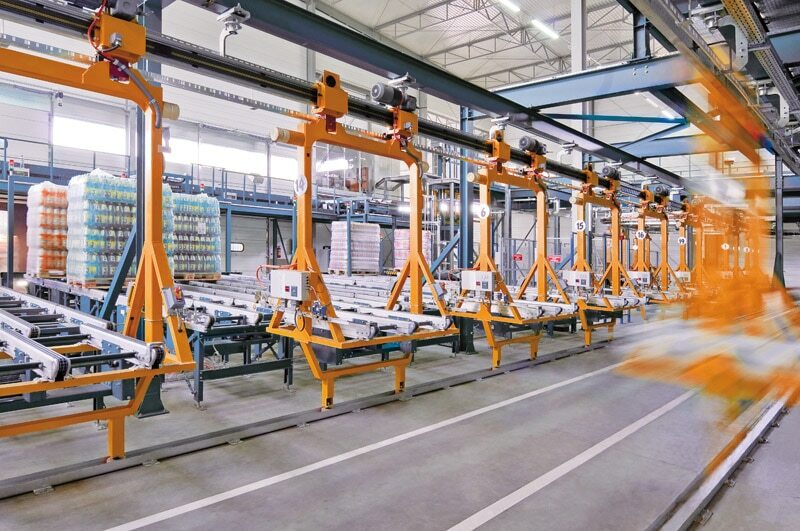 The control system evaluates trolley flows and the loading and unloading requirements at each point in the circuit in real-time. By doing so, it can assign goods loading and unloading tasks to the trolleys and avoid possible bottleneck situations. Besides that, the control system is set up to streamline power usage and manage the acceleration and braking of the trolleys, which means movements are smooth and almost noiseless. There are two types of electrified monorails: aerial ones and floor-mounted ones. Their components, assembly and commissioning are very similar. However, both their applications and advantages are quite different. Choosing which model to install will depend on diverse variables, like the transport needs that must be met, operations planned by the business or load characteristics, among others. These are the best-known commercially available models. 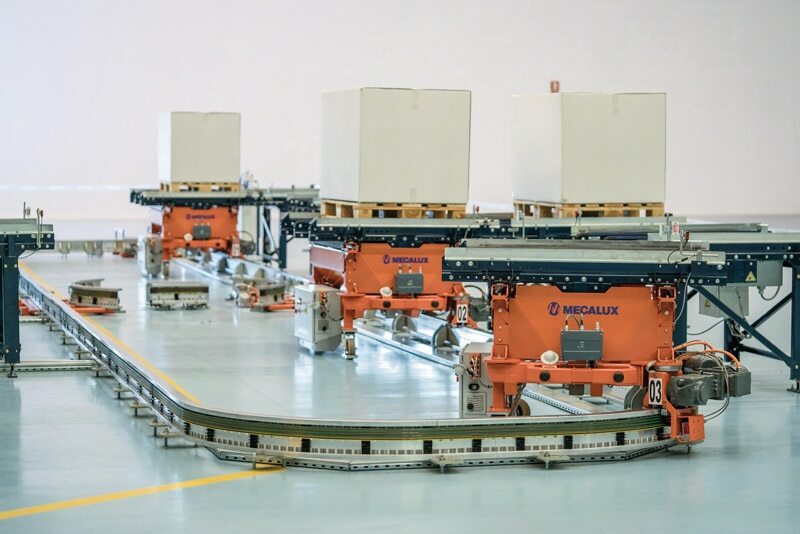 This pallet transport system uses autonomously moving trolleys that are self-propelled and suspended from an aluminium rail. The rail hangs from the building’s ceiling or a raised structure. The rail is strong enough to withstand the loaded trolleys. It also fulfils a two-pronged role: first, it comprises the path the trolleys circulate on and guides them along this route and, second, it houses the copper conductors that supply the electricity to the trolleys, as well as the devices that track their position in the circuit. The biggest advantage of this system is the floor remains obstacle-free, letting other handling equipment pass by as needed. Warehouses whose floor is of poor quality or badly levelled. Installations where there are uneven floors with up to a 3% incline. Zones that require constant cleaning (like food sector warehouses). Storage chambers that run at low temperatures (frozen). These electrified monorails, whose rails rest on the floor, are best suited to medium-length circuits. They are easily implemented, as the only thing that needs verifying is that the floor is level and strong enough to attach the guide rails. This model is a good fit for recirculation circuits that link entry and exit points of an automated warehouse to picking stations or outputs to dispatch. Electrified monorails usually offer the same benefits as the aerial version, the only exception being that the floor is not left open for handling equipment to run through. Moreover, by not having auxiliary structures, the circuit can be easily modified.